The Breville Smart Grill™ — Breville designers re-envisioned the craft of indoor grilling. Dishwasher safe plates embedded with smart heating elements inspire pitch-perfect results. 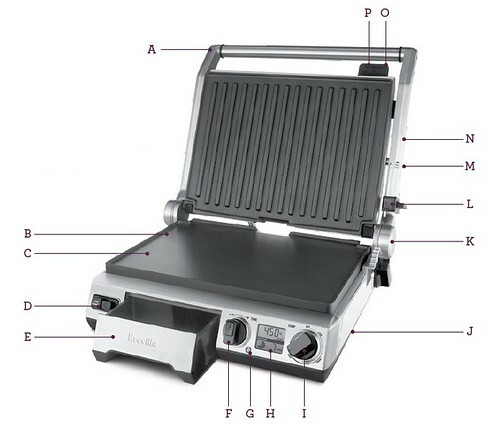 Top quality nonstick indoor grill with six height settings and integrated drip tray. Adjust the height to avoid crushing food or open it all the way up in 180° barbecue mode. Temperature responsive LCD display colorfully alerts when the grill is ready to go. Tilt the bottom plate to drain fats in the easy-to-handle drip tray. A. Stainless Steel Housing - with Die-Cast arms. B. Cast Aluminum, Non-Stick Plates - coated with titanium infused Quantanium™ for oil-free cooking and easy clean up. C. Removable, Dishwasher Safe Plates - flat plate for eggs and pancakes, ribbed plate for searing meats. D. Bottom Plate Release - removes the bottom cooking plate. E. Integrated, Removable Drip Tray - catches excess fat for healthier cooking. F. 30 Minute Timer Dial with Sound Alert - pressing the center button of the dial activates a count-down timer. I. Temperature Dial (320°F - 450°F) - with LOW, PANINI (sandwich), and SEAR modes. J. Cord Storage - located on the underside of the grill. 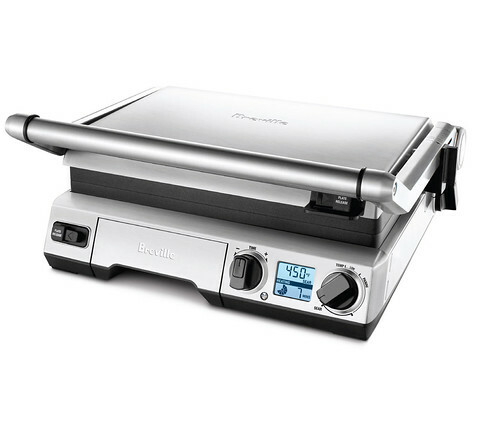 K. Adjustable Plate Tilt - Adjusts the angle of the bottom cooking plate to drain fats, or can be made flat for eggs and pancakes. L. Locking Storage Clip - locks the plates closed for upright storage. M. BBQ Lock Release - allows the plates to be opened completely flat, side by side, to provide a large BBQ grilling surface. N. 6 Adjustable Height Settings - reduces the weight of the top plate on delicate foods or can be set high enough for open melts. O. Leveling Support - Integrated into the top plate release, use to adjust the position of the floating top plate. P. Top Plate Release - removes the top cooking plate.